It took about five years to research Going Ape: Florida’s Battles over Evolution in the Classroom, and after all that time and effort the book finally became a reality in April 2014. I’m so grateful for all of the wonderful feedback I’ve received since its publication. For instance, Daytona Beach News-Journal columnist Mark Lane wrote: “… this is relevant history and Haught works hard to be fair and factual even when writing about the odder, more anti-modernist anti-evolution activists.” Those odd people and their passionate antics are exactly why I wrote Going Ape and they’re why I continue to monitor their activities. And there is more to this never-ending story to come. It’s 2018 and evolution is back in the news in the Sunshine State. A brand new law that changes the way textbooks can be challenged by citizens and and another new law that guarantees “religious liberties” for school personnel and students have already set the stage for a new series of evolution battles. This is the next chapter playing out live right in front of us! Keep an eye on my blog for all the latest. This site is a companion to the book. You’ll be able to view some of my source material, including school board meeting minutes, video and audio clips, and even lesson plans comparing evolution and creationism that were intended for classroom use. Would you like to try it before you buy it? 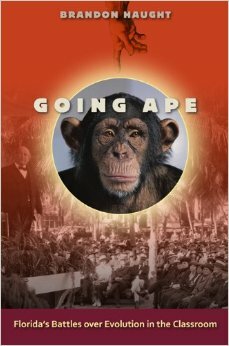 I welcome you to read a free excerpt from Going Ape hosted at the National Center for Science Education website. The book is available at your book seller of choice. You can go to the University Press of Florida, Amazon, Barnes & Nobles, etc. You can also go to your local book store. If they don’t have it on the shelf, you can ask them to order it for you. I’m available to give presentations, serve on discussion panels, talk with reporters, etc. Contact me through email or social media. I can speak about the subject of my book, related current events, and topics more general or specific as the situation warrants (such as global warming and teaching high school science). See the Events page for more information on my future and past events. I’ve been a guest on the popular radio show Science Friday, a column I wrote was published in the World Views section of the science journal Nature, and I’ve been interviewed or had op-eds published in media outlets all around Florida and the U.S.
I’ve been writing in various formats for years. I was a Marine Corps combat correspondent and an opinion page columnist for a newspaper in North Carolina. I invite you to read some of my past works, including a story about the 1995 Oklahoma City federal building bombing and the 1993 Amtrak train wreck disaster in Alabama.